Are you planning to expand the reach of your business transactions? Hoping to sell large quantities of products overseas? If you are, then you might be looking for ways to deliver or ship your products. What you need is a freight shipping company. With tons of shipping companies out there, it can be challenging to find the perfect one. The best one for you will depend on your budget and the services you’re looking for. 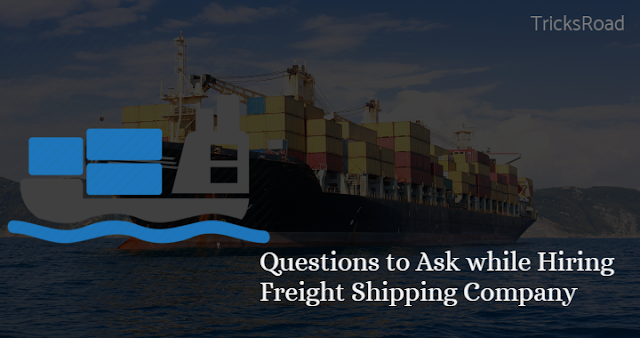 Below, we’ve got a list of 10 questions you should ask any potential freight company. 1. Is the Freight Shipping Company Certified? Before you eat at a restaurant, you want to make sure it’s got all its legal papers sorted. It should have the necessary permits and licenses. It has to be legit. Hiring a freight company is very much the same. You want to make sure the freight company is fully-licensed and certified. If it has accreditation, all the better. You’re not expected to have intensive knowledge of authentic permits and licenses. Sometimes all you need to know is the official seals of the city, state, country, or transport bureau. The shipping company should have a registration to operate in that state or country. 2. What Can I Ship? Freight shipping companies can transport anything. You name it: commodities, goods, cargo, even hazardous materials. If you will be shipping hazardous materials, your options might be a little limited. Got fragile goods? Freight companies can ship them with the right equipment. Whether you wrap your delicate cargo, most shipping companies will guarantee that they will deliver them in one piece. They won’t even care if you promote your brand with custom packaging. As long as you have the required documents for your cargo, they’ll transport it. 3. Can The Company Handle My Shipment Right? Are your products big but fragile? Are your goods perishable? Will your item need specific transport care instructions? If you have a specialized product, you’re going to want a shipping company that has the experience to take care of it. Ask them if they have handled similar shipments before. The freight company might already have the specific tools to ship your item. It wouldn’t hurt to look online too. Find clients of theirs who have had similar packages delivered. 4. What Are My Freight Shipping Options? There are many shipping options depending on how big, how many, or how far you need your item shipped. Often, freight shipping companies will have the ability to handle any shipping option. You only have to find the one that will suit your item best. The LTL freight shipments are for cargo larger than parcel but not large enough for a truckload. The TL fright option is for bulk shipment or pallet loads that can take up a whole semi-trailer. LTL shipping is for shipments weighing 150 – 15,000 pounds while the TL option is for more than 15,000 pounds. Intermodal shipping is moving shipment with the combination of a rail and truck. Some varieties for transportation include ships for a faster shipping process. Expedited freight is for rush or time-critical shipments, often via truck or air transport. As a note, freight shipping options are different from fright classification. The next section will discuss what freight classes are. 5. What Are Freight Classifications? Freight shipping companies follow the freight classification system created by the National Motor Freight Traffic Association (NMFTA). These classifications determine the freight weight, dimension, density, ease of handling, and liability. This classification system provides a standardized freight pricing structure for shippable products. There are 18 freight classes. The number 50 is the lowest possible freight class. The highest number for a freight class is 500. Note that you must not estimate the freight weight and dimensions of your shipment. You can use freight class calculators online. 6. How Do You Determine Shipping Rates? Many factors determine freight shipping rates. These factors take account of the type of freight, mode of transport, weight, distance, and more. The shipping option is the common basis for calculating the shipping rate of a cargo. Different shipping options take into account different factors. LTL rates depend on freight class while TL rates consider distance and fuel charge. Flatbed rates consider mileage, the total weight of the shipment, and equipment type. As a note, you want to be smart with promotions on free shipping. Amazon lost $7.2 billion because of its free shipping deals. It’s fine because they earned money back through other services, but a smaller business might not do so well with free shipping deals yet. 7. How Long Does Freight Shipping Take? Imagine you’re a doctor-in-training and you ordered medical equipment online from overseas. They told you that your medical equipment will arrive within a week. Yet, it doesn’t arrive on time and you weren’t able to take part in a medical procedure because of that. If you were the customer, you’ll give low ratings to the seller because of the bad delivery time. Bad ratings on a young business make for an ominous future. One bad review can mean big losses. This is why it's important to know the exact transit time of your cargo. Their definition of transit time could mean transportation from port to port. That shipping period might not include time for collection, loading, arrival, or customs clearance. There is no harm in asking for clarifications. As a tip, some companies have cheaper offers for a longer shipping period. This can mean your item will be in a shared container. At the price of a longer wait, you get cheaper rates. 8. Can the Company Provide Other Services? If you’re a first-time business owner, you’re going to want to know where your products are. Good shipping companies will be able to provide tracking details on your shipment. If there are delays, they’ll let you know. Depending on your delivery strategy, you might need a holding facility. If you do, inquire about temporary storage areas and fees. 9. Do You Charge Any Extra Fees? This is always a good question to ask if you’re on a budget. Better to have asked rather than pay for something you weren’t aware you had to pay for. Not all but some freight shipping companies have hidden fees in the quote breakdowns. You might not know it but moving might have added fees, too. Extra fees could also be dependent on special care instructions. For example, they are applicable to the transportation of hazardous materials. 10. Does the Company Have Insurance? Trust a company with fair and well-made insurance policies. If you know what to look for in a company of any kind, it should always be insurance. Before you invest any money in a transport company, read their insurance policies. Unexpected things can happen to your products. They can get damaged, delayed, or even lost. The shipping company should have a process for dealing with those situations. If you have experience with small-scale delivery, you may have some situations in mind. Don’t be afraid to ask them about what they could do in these situations. In case these situations do happen, at least you’ll already have an idea of what to expect. These are the essential questions you should ask any potential shipping partner. Keep these in mind and you’ll find the best freight shipping company for your needs. Did you find the read helpful or informative? We’ve got more in store for you. Feel free to check out all our other guides. Here’s a post on some factors you should consider when you plan on starting your own business.